I hate shopping. Well, actually I love finding bargains, I just hate malls and trying to find what I want. Craigslist and Ebay know me and cringe (except when there is wine involved). A good pre-season sale and a glass of Pinot, and I’ve been amazed at what arrives from my online spree when spring thaw has finally occurred. A couple days ago a fellow Dave’s Garden subscriber mentioned that the local Walgreens and Shopko type stores were already starting to sell sad, unwatered, over-sunned perennials on huge discounts. She bragged about her haul of “to be saved” Proven Winners. So of course, not to be outdone I rushed into Menards to see if I could find a caryopteris to replace the one that didn’t make it through the winter. I love that it is one of the last to bloom before snowfall. 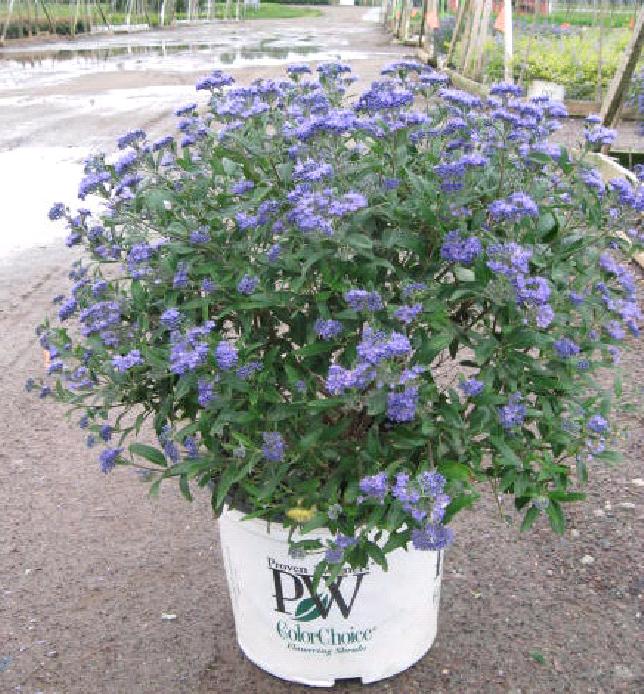 Well yes, I found one – nice sized Petit Blue, and a Rose of Sharon and a really great rasberry colored butterfly bush. A little more than I intended. Not on sale. Semi-bedraggled. But hyped on a shopping buzz, I just couldn’t walk away. So I over bought and over paid, and now have to find a spot for my new treasures. If that weren’t bad enough those Dave’s Garden people posted tonight that a trip to Eberts in Ixonia is a “must!” Looks like fun.